Carlisle United have been knocked out of the League Cup after taking their match against Liverpool to penalties. The hosts took the lead with a headed goal from Danny Ings, but Derek Asamoah soon netted an equaliser for the visitors. The 6,000 travelling fans cheered "Keith Curle's Blue and White Army" as the game went to a penalty shootout after a stalemate in extra time. Both sides missed two penalties before Bastien Hery's shot was saved by the Reds goalkeeper Adam Bogdan, securing the tie for the Premier League giants. Liverpool face Bournemouth in round four next. #LIVVCUFC Penalties it is, the Blues have taken it all the way. Follow the action minute-by-minute as Carlisle take on Liverpool in the third round of the Capital One Cup. 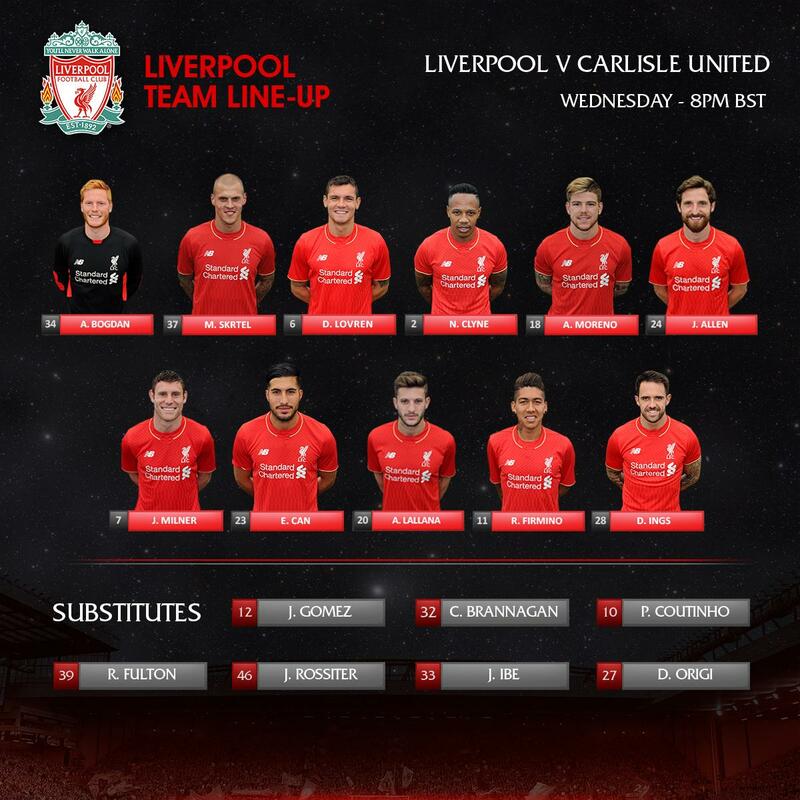 Can Carlisle United shock Liverpool? As nearly six-thousand Carlisle United fans head to Anfield, we assess what hope the Blues have of toppling the Premier League giants. Carlisle United have sold their allocation of tickets for the away match against Liverpool on Wednesday 23 September. All 5,744 tickets have been sold, and Liverpool FC will not be increasing the allocation for Carlisle fans. Carlisle United will take on Liverpool in the third round of the Capital One Cup on Wednesday 23 September. 5,744 tickets have been allocated to Carlisle fans for the 8pm kick off. Priority for tickets will be given to Season Ticket holders. Any that remain after this will be offered to membership holders and supporters who also purchased tickets for the Barnet and QPR fixtures. Tickets will then be placed on general sale. Tickets will be on sale from Sunday 6 September from the East Side of Brunton Park at the Pioneer Foodservice Stand. On Sunday 6 September the Main Ticket Office will not be open, nor will telephone sales be available. For more ticket information for the Carlisle v Liverpool game please visit the Carlisle United Website.